Yesterday afternoon on the Wirilda Track. 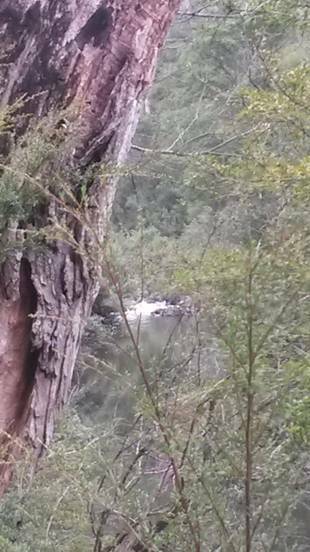 We spent a couple of hours or so walking downstream (& back) along the Tyers River from the W3 Track. I should have taken more photos. Forgot my camera, and forgot that my phone has a camera. Wirilda is a well-made and pleasant track with many lovely views of the river (though often through vegetation limiting photo ops!). It begins at the old Morwell Pumping Station just off the Tyers-Yallourn North Rd (about 10 km North of Morwell) where it crosses the Tyers River and continues for about six hours to the Mondarra Reservoir. There are some fine campsites at the end of the W3 (though you will have to remember to carry water up from the river there), on the W12 & etc. 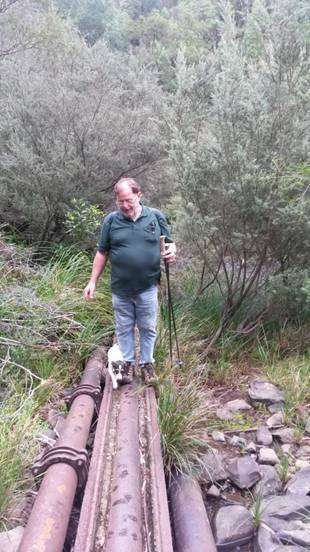 There are numerous mementoes of the early water supply history such as this pipe crossing of the river below the W3 Track and in one spot about a km above the pumping station the remains of an early WOODEN water supply pipe. The river IS canoeable, and has some entertaining small rapids. Years ago I had it cleared pretty well from the W3 down (about a four-five hour trip), but I imagine it would now need a little more work (so take a bow saw!) You will scrape the boat a little but it is a lovely river and abundant in fish and crays. It is almost always canoeable as there is a requirement of 3 megalitres of ‘environmental flow’ out of Moondarra (which is JUST enough). Note to self: A lot more work would create a 2-3 day trip downstream from Moondarra.